Our expert-led family holidays are designed to be relaxing and stimulating, fascinating and fun for all ages. What could be more fun for your family than experiencing an unforgettable real-life adventure, exploring ancient mysteries and glorious landscapes, playing and relaxing in a perfectly stress-free setting? We started organising expert-led cultural gulet cruises for families a number of years ago, as many of our guests had asked us to create tours they could enjoy together with their children and grandchildren. Since then, they have become a regular feature of our yearly tours – and one of our favourites! 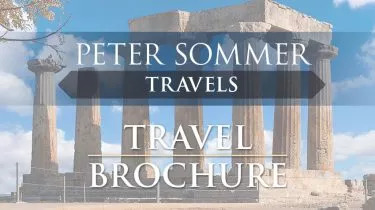 Like our other escorted tours, Peter Sommer Travels’ family holidays are cultural gulet cruises, led by an expert guide. Visits to ancient sites will take you and your children deep into the past and offer you a vivid and hands-on glimpse of antiquity. So, why not treat yourself and your loved ones to one of our family tours? It will be a unique experience of effortless learning, exciting adventure and carefree fun. A truly superb holiday. As well as our scheduled tours we can of course create bespoke family tours on land or as a private gulet charter. 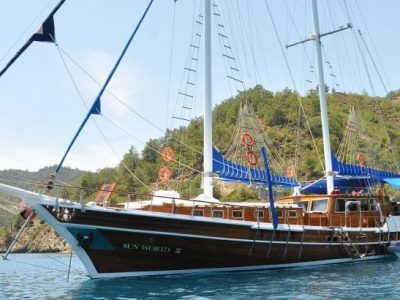 We started organising expert-led cultural gulet cruises for families after clients asked us to create tours where they could bring their children and grandchildren. We’ve loved putting them on and when Peter himself has led family tours, his family including wife, Elin, and children have come too. When are our Adventure Family Holidays? We usually offer scheduled family tours to coincide with the May and October half term holidays in the UK as well as one in the summer months. Visit our Escorted tours page to see the dates of all our trips. We also create family tours and private gulet yacht charters to order, so if you would like us to create an adventure family holiday for you in Turkey, Greece, or Italy please get in touch. We’ll be delighted to help. Andy Wilson, London, UK – travelled with us on adventure family holidays in Turkey in 2006, 2007 and 2009. “That trip was amazing. The food, the sights, and my favorite part was the swimming! Jumping off the boat into the crystal clear water. I also loved dropping the anchor and swimming in a cove all day. Then, after each day of sailing, swimming, sightseeing, and hiking, you get to lay down on your comfy bed and get a good night’s sleep”. Average rating 5 out of 5 from 372 reviews for Family Tours, according to AITO reviews.